(The Root) — The Pennsylvania Commonwealth Court decision (pdf) to halt implementation of Pennsylvania's voter-ID law until after the 2012 election may represent another tipping point in the Republican battle to limit the vote of likely Democratic voters. Advocates fighting to halt the imposition of these restrictive voting laws have won — in whole or in part — rulings limiting these laws. This is an important turn of events, for several reasons. For partisans in the campaign effort for President Barack Obama and Gov. Mitt Romney, the stakes in these cases are high. There can be no doubt that the states identified as swing states for the presidential election — among them Florida, Pennsylvania and Ohio — have been particular targets of Republican-controlled legislatures seeking to impose onerous conditions on voting. The leader of the Pennsylvania House of Representatives candidly announced to a Republican gathering that Pennsylvania's new voter-ID law would allow Republicans to win that state for Romney. In Ohio, Republican leaders attempted to restrict the hours of early voting in urban areas of the state more likely to vote Democratic. Indeed, what has distinguished these voter-suppression efforts from the pre- and post-civil rights movement's voting restrictions is geography. Past voter-suppression efforts were centered in the South. Voter-ID laws and other restrictive voting practices have proliferated across the country since 2008, but most intensely in those swing states won by President Obama in the last election. Prior to 2008, only 11 states had voter-ID laws. Since 2008, legislatures in 20 states have enacted such laws (although governors in five of those states vetoed photo-ID legislation). Likewise, early voting, which allows voters to cast ballots over a two- to three-week period leading up to Election Day, was regarded as an innovative and convenient voting method that would help working citizens, but also the elderly, disabled and rural voters. But after 2008, when President Obama's campaign successfully utilized early voting to mobilize young people, minorities and voters in key swing states, Republican-led forces began to push back against early voting. The effort in Ohio to allow more expansive early-voting hours in rural areas while restricting it in cities like Cincinnati was struck down by an appeals court in Ohio last month. In other cases, courts have either struck down or restricted efforts to impose conditions or burdens on voting. Without question, the battle in Pennsylvania is not over. The trial judge, Robert Simpson, had initially upheld the voter-ID law there. The Pennsylvania Supreme Court raised concerns (pdf) about the potential effect of the law and returned it to the trial court with instructions that the lower court stop the ID requirement unless it was convinced that there would be "no voter disenfranchisement arising out of the … [state's] implementation of a voter identification requirement for … the upcoming election." The trial judge's decision on remand halts the full imposition of the requirement for this upcoming election. But Simpson leaves in place the right of poll workers to ask voters for a photo ID. In a bizarre parsing of the statute and of the instructions issued by the Supreme Court, the trial judge stubbornly refuses to halt the implementation of the entire law, reasoning that asking for a photo identification — but not requiring one — will not result in voter disenfranchisement. Simpson's interpretation seems to either deliberately or recklessly ignore the obvious. Requesting a form of identification that cannot be required places an unnecessary and potentially disruptive obstacle in the way of voters — an obstacle that may result in precisely the voter disenfranchisement the Supreme Court warned against. 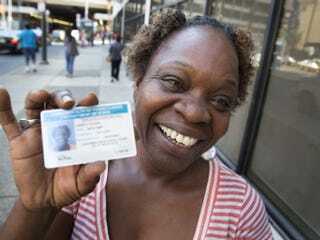 How will Pennsylvania voters, who by now have heard that the law cannot be imposed, react when poll workers nevertheless ask them to present a government-issued photo ID? It will be up to voting-rights advocates to educate the public about the effect of this ruling and ensure that the polls are staffed by trained individuals who understand the scope of Simpson's ruling. But it may well be that the Republicans have overplayed their hand in adopting these retro voter-suppression laws. The notion that these laws are designed to address voter fraud has been rather conclusively debunked. No evidence of measurable voter fraud has been adduced in any of the cases. Indeed, Republicans have themselves more recently been caught in a voter-fraud scandal. But Election Day outrage won't be enough. After Nov. 6, the Pennsylvania law will remain in place for future elections, and Simpson seems likely to take even greater license with his very cramped interpretation of the Pennsylvania Supreme Court decision after the spotlight of the election is off this case. Voting-rights advocates will need to sustain their pushback against measures designed to restrict access to the ballot. Sherrilyn A. Ifill is a professor of law at the University of Maryland Francis King Carey School of Law and a civil rights lawyer.